Carbon emissions across all nine Amazon nations have been fully matched by carbon absorption by mature Amazon forests since the 1980s, new research shows. Study lead author Professor Oliver Phillips, from the University of Leeds, said: "Since 1980 roughly 430 million tonnes of carbon has been absorbed by pristine Amazon rainforest each year, which is almost four times the UK emissions for 2016. "For the nations of the Amazon basin as a whole this means that since 1980 the carbon uptake has matched the entire combined emissions from deforestation and fossil fuels." Co -author Dr Roel Brienen, also from the Leeds School of Geography, said: "This reveals the sheer scale of the ecosystem service the Amazon forests are providing. "We've known that the Amazon rainforest forest provides a 'carbon sink' but until now no one had looked at those absorption figures in the context of national boundaries. We found that in nearly every nation carbon uptake has outstripped emissions from fossil fuels." The Amazon rainforest's carbon sink, also known as carbon sequestration, is the process by which the forest removes and stores carbon from the atmosphere. 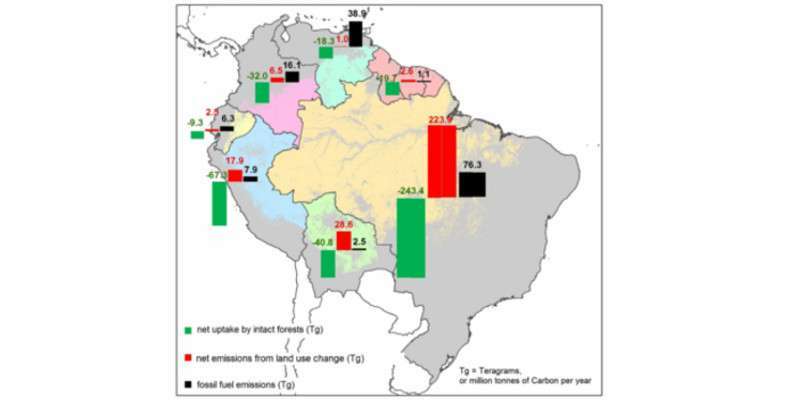 A study, published in Carbon Balance and Management, compared estimates of the Amazon rainforest carbon sink to fossil fuel emissions data from the nine countries where mature Amazon forests are found – Brazil, Bolivia, Colombia, Ecuador, French Guiana, Guyana, Peru, Suriname and Venezuela, as well as emissions from forest loss and degradation. 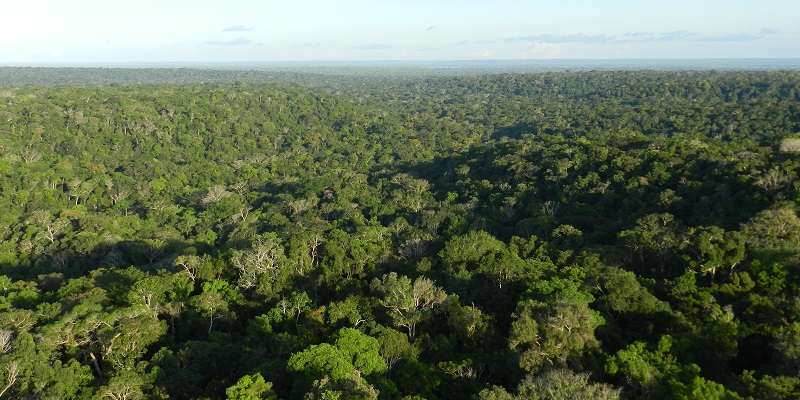 The estimates for the Amazon's carbon uptake were gathered from more than 300 mature forest plots across the five million square kilometres of remaining Amazon forest, each tracked for up to 30 years. These plots were monitored by more than 100 researchers in the RAINFOR network – a unique research network dedicated to monitoring the Amazon forests. The study showed that since 1980 in almost every Amazon nation the average annual carbon uptake into mature forests has been at least twice the size of the nation's fossil fuels emissions. The study also found that for all nations except Venezuela and Brazil uptake exceeded the combined emissions from burning fossil fuels and carbon emission from deforestation and forest degradation. However, this balance is on a knife edge. The study showed carbon emissions from all nine nations have been increasing and the gap between uptake by mature forests and those emissions is getting smaller. This is partly due to the increased rate in which Amazon trees are dying as recent RAINFOR research has shown. Professor Phillips said: "While forest replanting and regrowth also help counter emissions, our study suggests that the uptake from these 'secondary forests' is significantly smaller than those of mature forests. "This shows that losses from deforestation can have overwhelming impacts on carbon balance and further underlines the importance of conservation measures to keep the Amazon rainforests intact. "Many of us are waking up to the challenge of the two degree climate change target set in the Paris Agreement. But less appreciated is the fact that – so far – we have been getting a free ride, with global forests and oceans mopping up more than half our carbon waste. "Every Amazon nation conserving large areas of their forests has been contributing globally-significant carbon sequestration. By protecting their forests, the countries of South America are doing the rest of us a big favour." I agree, there should be a major effort to reduce, stop, and recover from amazon deforestation. Perhaps if we'd focus more effort onto this real problem and solutions rather than on fear mongering about CO2 emissions we could actually achieve something.